With all of the criticism leveled at this fourth Batman installment, for the first time I actually agree fully with the lead casting - Clooney looks the part with the more square jaw and can be suave, macho as well as romantic and witty. But most importantly, he looks like Batman should, not blonde and pouting. But during action sequences it doesn't really matter if it's Clooney or the stuntman, as it's the suit and cape featuring. Schumacher's neon fetish gets an overdose, and as the afflicted scientist bad guy Mr. Freeze, Schwarzenegger delivers too many lame cold puns that are too much to bare. 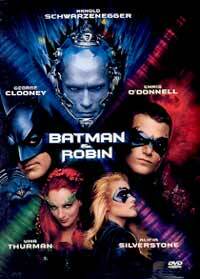 As Robin, O'Donnell is an annoying brat and the even more grating Alicia Silverstone gets squeezed in as well, diluting Batman's one-man operation even more. By far the worst of the bunch (thus far).